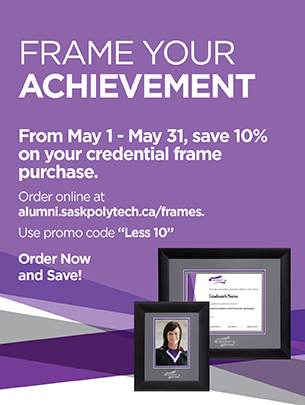 The Saskatchewan Polytechnic Alumni office has partnered with Milburn Universal Design to offer custom matted high-quality design frames for certificate, diploma, and degree parchments. We also offer graduate portrait frames. To view the frame styles available or to order your frame, please visit Milburn’s secure online store. Choose your shipping option when you check out. Need a transcript or a copy of your certificate, diploma or degree? Has yours gone missing or been damaged? Not to worry. Simply log into mySaskPolytech and make an online request or fill out a printable document request form and submit it to Enrolment Services. They’ll reissue your transcript at no charge. Duplicate certificates, diplomas and degrees are $30.